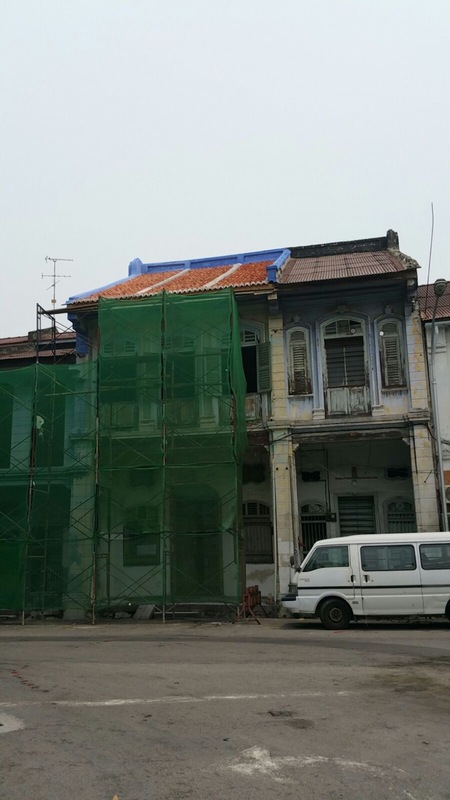 The roof repair works at no.58 Rope Walk or Jalan Pintal Tali in Penang is in plain sight for all to see. And I am rather proud of the end result because of how it will contribute to the critical discussion on appropriate conservation approaches, choices and forms of interpretation being offered to shophouse owners in Penang. When I decided to repair the roof of my grandfather’s shophouse, I applied the principles of replacing like for like in respect of the heritage fabric and of maintaining the layers of history as found. What you see today is exactly the way it was when the Control of Rent Act was promulgated after World War II. There have been no material changes since then as the implementation of rent control literally discouraged all owners of tenanted buildings from spending money on maintaining their properties. The contractor who installed the roof chose to create two cemented strips as permanent hard bases in the direction of the roof slope. A worker needing to replace a broken tile or adjust a displaced tile could lay a timber plank transversely across the roof on top of the cement strips and use it as a working platform without endangering the tiles. For all I know, it could have been my grandfather’s suggestion for he was an innovative and yet practical man who had come to Malaya from China as a young boy and who eventually developed the town of Lunas in Kedah. And I also recall very vividly, when I was growing up, witnessing my father’s contractors securing the end tiles at the fascia of shophouses with cement, as was the case with many shophouses in town. Lime was otherwise freely used in other works like plastering of walls and mortar for brickwork. The simple exercise of repairing a roof has thrown up several positives. One, it has allowed me to step back in time to “converse” with my grandfather and to personalize the architectural and social history of the place. And for me this is one of the most meaningful reasons for conservation because there is a story to tell, of making the past come alive in the present. In Asia, the structuralist analytical approach towards assessing significance and maintaining authenticity that is characteristic of Western conservation practice needs to be nuanced by the metaphysical concepts which prefigure the construction of space throughout the Asia region. It should also be tempered by the region’s time-honoured traditions of practice. Conservation practitioners should not over-emphasize the authenticity of the materials or physical substance of a resource to the extent that they overlook other equally or even more important dimensions of authenticity. All judgements about values attributed to cultural properties as well as the credibility of related information sources may differ from culture to culture, and even within the same culture. It is thus not possible to base judgements of values and authenticity within fixed criteria. On the contrary, the respect due to all cultures requires that heritage properties must be considered and judged within the cultural contexts to which they belong. As a corollary to the ideals and principles stated in the Document, Herb Stovel (deceased), one of its authors, suggested that respect for cultural and heritage diversity requires conscious efforts to avoid imposing mechanistic formulae or standardized procedures in attempting to define or determine the authenticity of particular monuments and sites. Last but not least, I am reminded of earlier efforts by Badan Warisan to formulate conservation principles that reflect Malaysian values based on the premises mentioned in the preceding paragraphs. It appears timely for us to revisit the material in our archives and to embark on a project to deliver what we once called the Stonor Principles, named after the location of our present heritage centre. China has its China Principles. Australia created the Burra Charter. The conservation of Malaysian heritage should be guided by local observations, experiences, traditions and wisdom. Google, Wikipedia, Yahoo Answers. I love them, such great tools. It’s become so easy to become an authority on any subject nowadays; anyone can be an expert on anything. With Melaka and George Town’s inscription on the UNESCO World Heritage List, it’s like, suddenly, everyone is a conservation architect/expert. I have found, in my limited experience of being involved in a handful of international award winning restoration projects, that when the project team endeavours to consider a range of conservation approaches which are based not only on the multitude of documents outlining principles and standards which we should aspire towards, but also on collective experiences and practices, that the outcome is “right” and stands up to the test of time. Let’s consider the debate of lime vs cement. Experts will loudly chant the mantra “lime good, cement bad”. Nothing wrong with that in many instances, but then, not always right. Add in another mantra – “replace like for like”. Then what happens when the heritage fabric is not lime? Do we replace with lime and then we can easily put a tick against the “right” box? Or should we instead acknowledge that conservation is possibly more complex and there are probably several other issues which affect the authenticity of the place? I will desist from going on….Just to say thought that I liken this to walking a tightrope between what is the more accepted standard – a somewhat prescriptive “Western” conservation approach – and our (Asia’s) longer traditions of cultural practice and context. So, next time, before jumping on whichever band wagon catches your fancy, guns blazing, shooting off your “expert” opinion, you may want to #getyourfactsright. It could save you a little embarrassment. This entry was posted in About Us, News & Events, Opinions, Talks & Lectures and tagged Adaptive Re-Use, badan-warisan-malaysia, Conservation Principles, Elizabeth Cardosa, Fact Check, heritage, Laurence Loh, Opinions.